Having absolutely zero competition to govern the market, the fate of the consumer is left solely in the hands of the Public Service Commission (PSC) to determine what costs, practices, and profits are acceptable. Almost every year these hearings are held to determine what the proper costs should be as well as to set the guaranteed rate of return for the shareholders of the company.That’s right, for those of you that play the stock market could you imagine if the company you were investing had a predetermined and guaranteed return of 10%/year? With one governing body having 100% control over the market conditions it is vital that they remain on the side of the consumer to keep the cost at a fair rate. In this article we will review every major rate change approved by the PSC over the past 15 years for LG&E and KU. After looking at what our energy prices have done over this period of time we will be able to have a very good idea of what these prices will look like 5, 10, or 20 years down the road. As the rate at which energy costs rise, so does the viability and savings potential of a home solar system, so we will analyze exactly what has happened in our market, giving us the most accurate savings projections for solar systems moving forward. Breaking down the charges on your bill. Before we jump straight into the PSC cases over the past 15 years, let’s first break down your electric bill. Have you ever thought about how they come to the final amount that you owe? Of course it is based off of how much energy you use, but in this section we will get more specific. Most people think they multiply your usage by a set rate and that is your total, however that would be much too easy to understand. Instead you will see numerous charges, all of which are a factor for how much energy you consumed. Below is a picture of a standard electric bill. We are only concerned with the section that shows charges being added up. -As you can see everyone has a basic service charge of $10.75/month regardless of usage. -Next you will see Energy Charge at $0.0864/kWh. 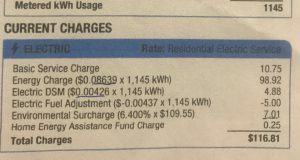 When we add the 3 charges up, we find that the actual rate we are paying per kWh used is $0.104/kWh. So if all 3 charges are a factor of how much energy is used, why not just add them all together and have a base rate that covers everything? Well, as you will find out throughout this article, each charge has a different method required to get changes approved. By having 3 different avenues to increase revenue LG&E and KU are maximizing their opportunities to do so. What is the Environmental Surcharge? From the mid 1980’s through the mid 90’s energy prices in Kentucky remained constant and were among the very lowest in the country. LG&E and KU did not begin testing the PSC until 1994 when they were approved to add an additional charge on your bill known as the environmental surcharge1. As new environmental policies began to be federally enforced, LG&E and KU were going to have to begin spending more money on environmentally friendly practices dealing with production, waste, etc. Obviously the shareholders are still going to get their +10% rate of return, so how would the costs of the additional expenses be recouped? Well through the consumers of course. The cost per kWh had remined very constant at around $0.05/kWh, so rather than raise the kWh charge, they decided to add a separate environmental charge to recoup this money. The cost of this would be assessed every 3 years and change accordingly. Increasing revenue through a separate avenue without actually changing the specific kWh price was better for PR, and now gave them two ways to increase the cost of energy. After a decade of LG&E and KU milking the environment surcharge as a way to generate additional revenue, PSC passed it next major change to the rate structure in 20042. Below is from the PSC official ruling. -As you can see the average bill for LGE electric customers rose from $55.94 to $60.93, or an increase of 8.9%. These approved changes where so high that immediately following this rule, a 3rd party internal investigation into the PSC was ordered to ensure no foul play took place during the ruling3. After a year investigation the ruling was determined to be legitimate, but this raised a major red flag moving forward as the questions surrounding this ruling caused much of the public to lose trust in the PSC. In the end, the 2004 rate case allowed LGE and KU to increase their yearly revenue by a combined $108.6 million. By 2009 the average energy costs per household for LGE had jumped from $60.93/month up to $68.18/month4. This translates to a 12% increase over 4 years, steadily rising at 3%/year. Over the same amount of time the KU average bill moved from $58.29 to $62.31, giving us a 9% increase in just 4 years, about 2.25%/year. The following year LG&E and KU decided it was time to up their revenue once again. This go around, just a year after their last increase, they were approved for $7 increase to the LG&E average bill and a $4 increase to KU average bill bringing them up to over $75/month and $67/month respectively. With this approval the two energy giants were able to increase their yearly revenue by a combined $189 million5. At this point the flood gates began to open, with new rate cases coming almost every year. If we are just considering that average total bill for each residence, the increase over the past 15 years has been drastic. 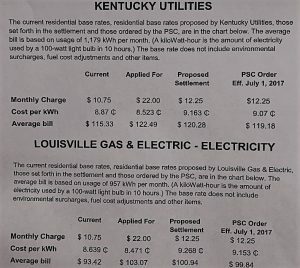 Before the PSC began approving increases almost every year, back in 2004 the average bills were $55.94 for LGE based off of 950 kWh/month and $54.79 based off of 1200 kWh/month for KU customers. This means that back in 2004 KY residents were paying between $0.04-$0.05 per kWh. When we compare that to the $0.1025 average that is the current kWh rate, we can see that energy prices have increased in KY by 80%. When we divide that by 15 years, the data tells us that energy prices in KY rise at a rate of 5.3%/year. 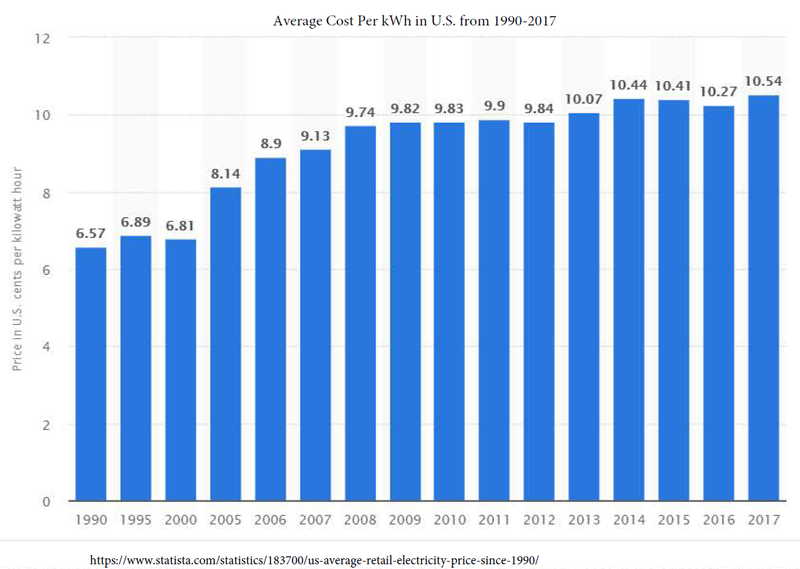 After enjoying some of the best electric prices in the country in the 90’s, we now find ourselves paying just barely less than the national average. You can see from the graph at the top that in 2017 the average cost per kWh was $0.1056. At the current rate of increasing by 5.33%/year, in just another 2 years we will have surpassed the national average. If the trends for energy pricing in KY remains constant for another 15 years, your $100 bill today will cost you double the money for the same amount of energy. Now that residential Solar is finally making its move in KY, for the first time our residents have a chance to do something about this expense. By investing in a home solar system, you can produce all of your own energy and free yourself from the grip of your electric provider. A system will take 8-9 years to give you a full return on your money, while every piece having a 25 year manufacturer’s guarantee. 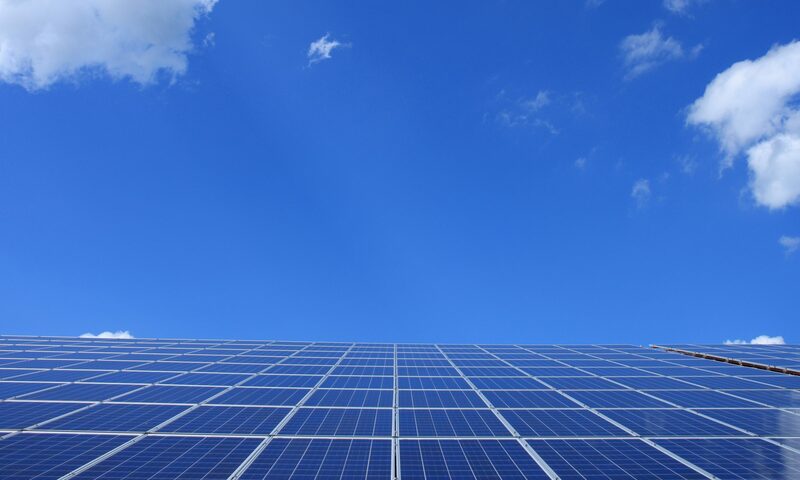 As the energy prices continue to rise, so do the savings generated from your solar system, and it will pay for itself close to 4 times over the life of the panels. Please reach out to me at Pure Power Solar if you have any interest in getting information on what a project like this would look like. When considering, just keep in mind that 15 short years ago your electric bill cost half as much as it does today! Previous PostPrevious Have Trump’s Solar Tariffs had a Positive or Negative Impact on Our local Solar Market? Next PostNext Residential Solar Inverters: SMA, Microinverters, or Power Optimizer’s?